The K League Challenge moves into it’s 16th round of the season, with 2 Saturday, 2 Sunday games as well as 1 Monday game. All 4 weekend games take place at 7pm with Monday’s game starting at 7.30pm. The highlight game of this round is clash between Out of form FC Anyang who host in form Seoul E-Land FC. Seoul started the season slowly but have built up an impressive run recently, however Anyang might be a sleeping lion and so this game should be interesting. 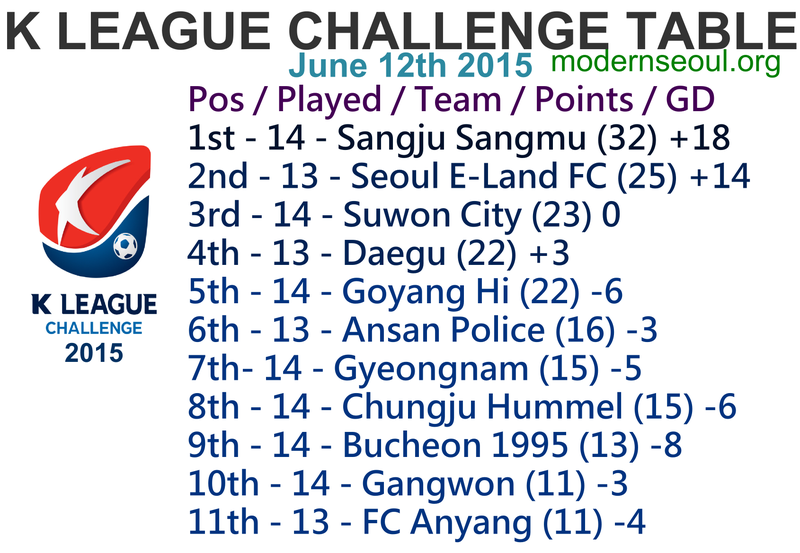 The league table is finally starting to take shape, with Sangju Sangmu 7 points clear at the top. Seoul E-Land, Suwon and Daegu make up the playoffs places. Goyang are behind them on goal difference. Then there’s a 6 point gap to Ansan in 6th, with Gyeongnam, Chungju, Bucheon, Gangwon and finally Anyang completing the K League Challenge Table. Prediction Update: 2 Correct Results but no perfect scores from this rounds 5 games. Suwon Bluewings lost their previous game but did pick up 3 wins and a draw from the 4 games before that. Seongnam FC have lost 2 straight, but won the two before them. Suwon don’t draw at home and as Seongnam don’t win away we see Suwon edging this one. #k리그 #k리그챌린지 #상주 #충주 뭔가 색다른 재미가 있기는 했지만, 프로 리그가 열리는 경기장에서 이 정도로 배수가 안 되는 건 꽤 큰 문제다. 어쨌든 수중전 축구에선 무조건 군인이 이긴다!